MEXICO CITY, Mexico (CNN) -- The police chief in Cancún has been relieved of his duties and placed under house arrest while he is investigated in the killing of a retired Mexican general who had been the area's anti-drug chief for less than 24 hours, Mexican media are reporting. 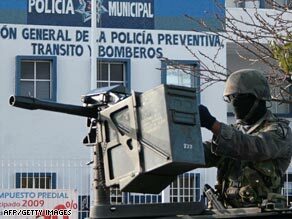 A Mexican soldier guards the entrance at a Cancún police station where the military is investigating a murder. Francisco Velasco Delgado was detained by military officials early Monday and flown to Mexico City, where he was placed under 45 days of house arrest, according to the media reports. With Delgado's removal, the military has taken over the Cancún police force, several newspapers reported. Cancún Mayor Gregorio Sanchez Martinez said the move was made "to facilitate all types of investigations into the triple murder that happened last week," the Diario de Yucatan newspaper said. Salvador Rocha Vargas, the secretary for public security for the state of Quintana Roo, will lead the police force. He said he will take all the pertinent measures "to clean up the Cancún police," the Excelsior newspaper reported Tuesday. Retired Gen. Mauro Enrique Tello Quinonez's bullet-riddled body was found a week ago on a road outside Cancún. Authorities said he had been tortured before being shot 11 times. His aide and a driver also were tortured and killed. Quintana Roo state prosecutor Bello Melchor Rodriguez y Carrillo said last week there was no doubt Tello and the others were victims of organized crime. "The general was the most mistreated," Rodriguez y Carrillo said at a news conference. "He had burns on his skin and bones in his hands and wrists were broken." An autopsy revealed he also had broken knees. Tello had been appointed less than 24 hours earlier as a special drug-fighting consultant for Gregorio Sanchez Martinez, the mayor of the Benito Juarez municipality, which includes the city of Cancún. Tello, who retired from the army in January at the mandatory age of 63, had moved to the resort area three weeks ago. Mexico is undergoing an unprecedented wave of violence that some have likened to a civil war. The government is battling drug cartels as the traffickers fight each other for control of the lucrative illicit market. Tello was the second high-ranking army officer to be killed in the area in the past few years. Lt. Col. Wilfrido Flores Saucedo and his aide were gunned down on a Cancún street in 2006. That crime remains unsolved. The latest killings come as Mexico grapples with the highest violent-death rate in its history. Mexican Attorney General Eduardo Medina Mora reported in December there had been around 5,400 slayings in 2008, more than double the 2,477 tallied in 2007. There already have been more than 400 drug-related killings this year, according to some news accounts.